El Tapatio has become a Page favorite Mexican restaurant, known for their flaming fajitas, Mexican specialties, Jumbo Margaritas, and imported Cerveza in their festive indoor booths and outdoor patio. 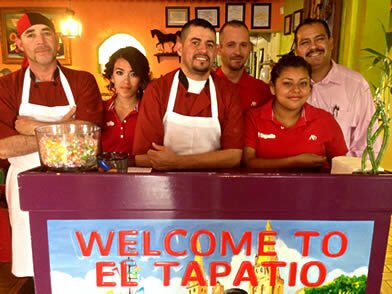 El Tapatio has an extensive menu that includes beef, chicken, and seafood enchiladas, chimichangas, tacos, tostadas and cripsy rellenos. All are accompanied with rice and bean or sour cream upon request. Make your favorite combination plate served with rice and beans or salad and fries. Fresh guacamole dip is a favorite appetizer in addition to nachos, quesadillas, cheese crisp, wings, camarones (shrimp), and much, much more. Molcajete is a favorite house specialty that includes grilled marinated steak strips, chicken strips, shrimp, onions, bell pepper and mushrooms cooked in a special sauce with rice, beans, and guacamole. If you love fajitas, you will love fajitas for two persons with your choice of steak, chicken, prawns or a combination of two delivered sizzling hot and served with a side of rice, beans, guacamole ad sour cream. El Tapatio Flaming for two includes boneless chicken breast, seasoned grilled skirt steak, fried wrapped with bacon jumbo prawns, green and red bell pepper, with a side of rice, beans, guacamole and sour cream. 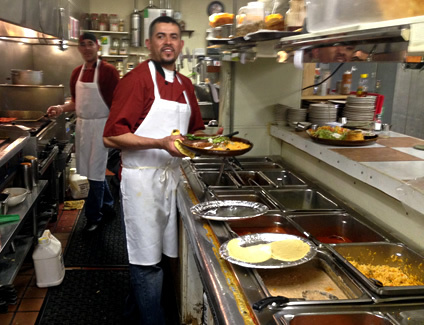 For vegetarians, El Tapatio has many delicious options; including salads, tostadas, chili rellenos, and a veggie burrito with beans and rice. Try their Veggie Chimichanga — a deep fried large flour tortilla stuffed with grilled garden fresh vegetables, topped with Ranchero sauce and garnished with sour cream and avocado slices. Served with rice and cholesterol free Rancho beans. H ouse and Specialty Margaritas come in regular and jumbo sizes and you can order your favorite tequila from a list of some 2-dozen top-brand agave tequilas. El Tapatio has an extensive ice-cold cerveza selection that includes Negra Modelo, Pacifico, Corona, Tecate, Bohemia, Carta Blanca, Dos Equis, and more. If you like domestic beers, El Tapatio serves Coors, Budweiser, Bud, Michelob, and Molson in addition to light varieties. El Tapatio has several locations in Colorado (Fruita, Grand Junction, Delta, Parachute) in addition to Page, Arizona.